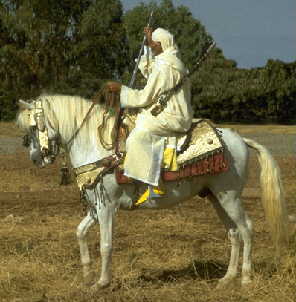 Almost all Arab Countries, have an important equestrian tradition, based on the meaning of the horse in the moslem religion. Several sayings by the prophet Mohammed deal with horses and their virtues. 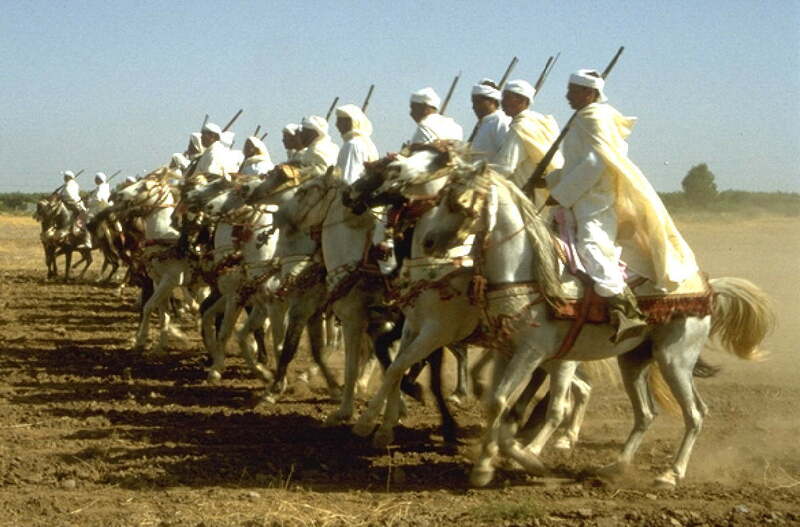 In the whole of the Maghreb, as the regions of Africa north of the Sahara are called in Arabic, there is a special equestrian performance called "Fantasia" in French , or in Arabic language "harrqa" resp. "barooda" or "t'bourida". These Arabic words describe the two main elements of Fantasia, "harrqa" meaning a quick movement, and "barood" meaning (gun-) powder. So you could translate the two words as "Moving Game" and "Gunpowder Game". There are several explanations for the origin of these games. The most logical one to me seems to be a military training of the preferred warfare method of arab cavalry: quick, repeated attacks. This method was an important fact for the Moorish conquest of the Iberian Peninsula in the 8th century, when the Spanish knights on their heavy battle horses were not able to stop the invasion from Northern Africa. 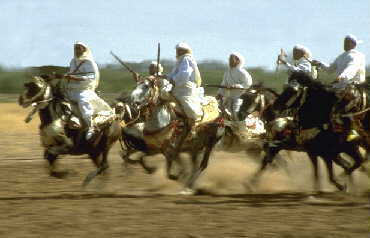 Still today, Fantasias are held throughout Northern Africa. Traditionally, they are a part of all bigger festivals, as well "moussems" (festivals held to honor local saints) as marriages or other rural events. 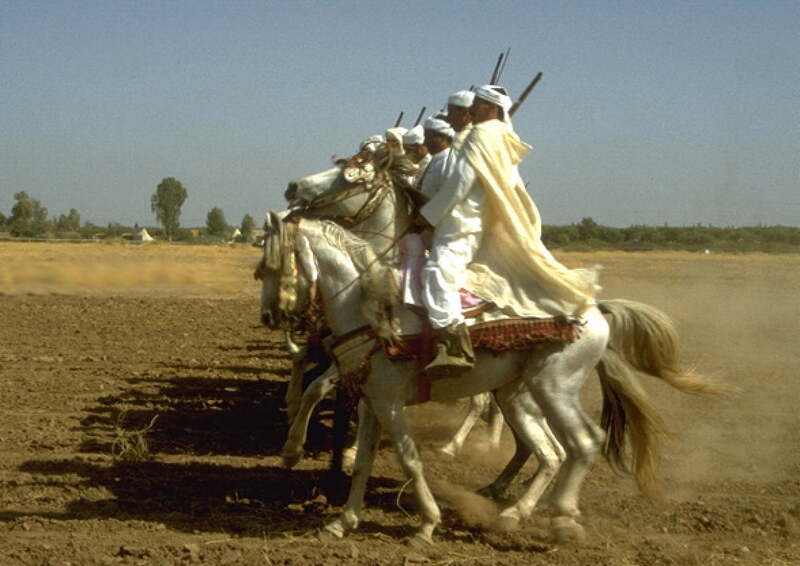 As a part of the efforts of the Moroccan government to encourage and preserve local traditions, nowadays there is a series of Fantasia contests organised by the "Comité de l'encouragement du cheval" (a department of the ministery of agriculture), which were initiated by King Hassan II and offer an important reason for the rural population to continue the breeding of pure Barbs. Without the earnings from Fantasia events, most of the farmers would not be able and willing to afford the feeding of a "useless eater", which Barb horses have become after the end of their usage as war horses-the precious Barb war stallions, as well as the even more precious mares, were never used for draught or other working purposes. The course of the Fantasias at the competitions follow a fixed scheme: First the riders line up at the beginning of the field. They present their guns and ride down the lane, first in slow gait. Then they return to the other side, and do the same again in trot. The third round finally is the "real thing": The riders gallop down the lane, and in the end they stop their horses abruptly and at the same monent fire their guns simultaneously. The aim is to do the whole exercise as simultaneously as possible-as well the riders in the line should be close together, and the stop and the shot should be at the same time. Of course this does not work out all the time-I have even seen horses trampling down or jumping over the straw bundles lined up to mark the end of the lane. In 1995, I have been invited to visit some of these events by the director of the national studs, Dr.N.Joundy, and so had the opportunity to experience the special athmosphere of these events (and to take pictures and videos, of course). 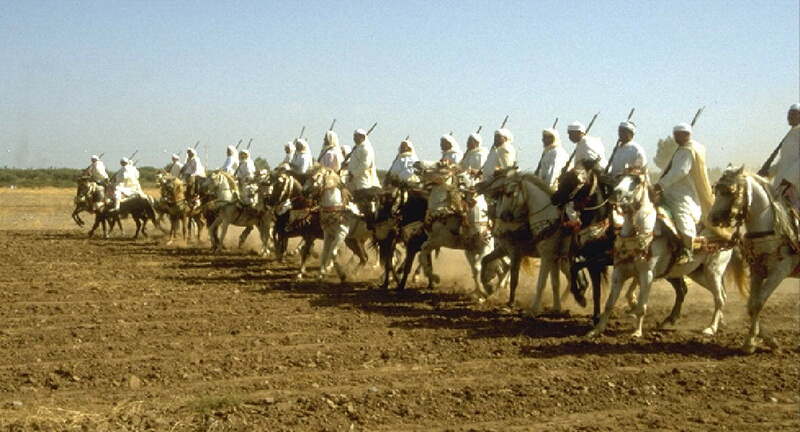 It is really impressing to see 15, 30 or more riders on their stallions lined up, galloping down the lane, and stopping suddenly in a huge cloud of dust, firing their guns simultaneuosly. At smaller festivals or private marriages, the course is not always like that. But the essential elements (galopping in a line, stopping suddenly with simutaneous firing of guns) are always included. At such "inofficial" events, it is also more likely to see some artistic elements like throwing the gun up in the air and catching it again, or balancing it on the rider's head, or twirling it horizontally or vertically. Those elements can also be seen at the state events, but since they are not a part of the official judgement, they are more a matter of the courage and skills of individual riders than an essential part of the show. The number of participants in a Fantasia decreases from West to East. 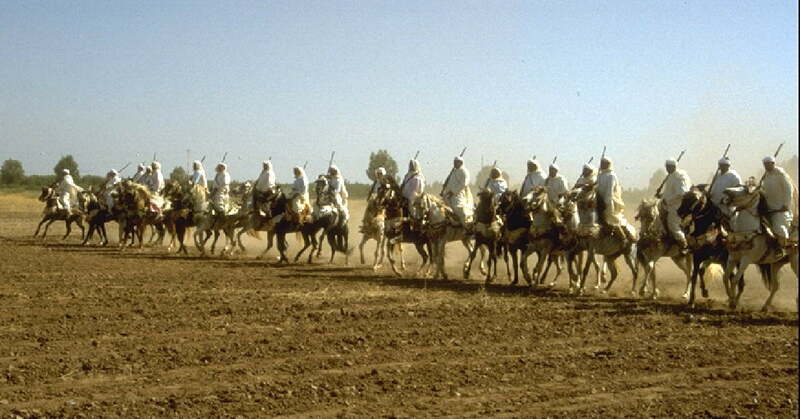 While in Morocco you can see huge groups, in some cases up to a hundred riders, they are already smaller in Algeria (usually not more than 10 - 20). 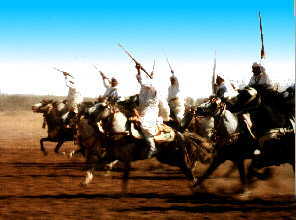 In Tunisia it is even possible to see single riders performing a Fantasia alone, which then mostly consists of a demonstration of skilled usage of various weapons, e.g. shooting more than one gun subsequently, and then maybe hitting a target with a sabre or sword.